IRON MAN: Extremis - Adapting the critically acclaimed storyline by superstars Warren Ellis and Adi Granov, Tony Stark (AKA Iron Man) faces his greatest threat ever – a terrorist transformed into an unstoppable force with bio-engineered Extremis super-soldier serum! Now, Stark redefines Iron Man's mission for the 21st century, sending the Armored Avenger in a new direction that will alter his life forever! 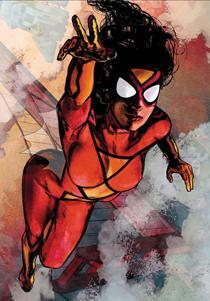 SPIDER WOMAN: Agent of S.W.O.R.D. - Developed by the legendary Eisner Award-winning team of Brian Michael Bendis and Alex Maleev, Marvel Knights Animation SPIDER-WOMAN: Agent of S.W.O.R.D. follows the new adventures of Jessica Drew as she rediscovers her existence in a world she did not make. Seeking revenge against those who destroyed her past, Jessica Drew must rise to become Spider-Woman again, even if it means her ultimate demise. Featuring guest appearances by Spider-Man, the Avengers, Wolverine, Black Widow, Captain America and Ms. Marvel, Spider-Woman comes to life in this thrilling Marvel Knights Animation adventure! With print magazines and novels making the leap to digital mediums, it should come as no surprise that comic books have also joined in with the migration. Traditional digital comics have been around for quite a while now, but some companies have taken the idea one step further. Instead of just presenting the comics as they appeared in their print forms, voice acting, effects, music, and animation have also been applied to create motion comics. 'Marvel Knights Spider-Woman: Agent of S.W.O.R.D./Iron Man: Extremis' includes two Marvel Comics miniseries adapted into motion comic form and while both do hold some entertainment value, together they demonstrate the inherent weaknesses that plague this unfortunately still clumsy new medium. While I am a big comic book fan, and am certainly familiar with several works by the creators involved (Bendis and Maleev's run on 'Daredevil' and Ellis's 'Planetary' are favorites of mine), I had not actually read either of the series presented here before hand. That being said, I was still well acquainted with the mythology of each character and the gist of some of the more recent major events in Marvel's sprawling universe of titles. Each motion comic is available to be viewed continuously or in separate episodes which more or less mirror the issue breaks found in their original release. 'Iron Man: Extremis' focuses on wealthy industrialist and weapons manufacturer Tony Stark, as he combats a crazed terrorist who has been given super powers by an experimental serum. As the peacekeeping hero Iron Man, Stark dons his iconic suit to save the day, but it seems even his technological upgrades may have finally met their match. Written by Warren Ellis with art by Adi Granov, 'Iron Man: Extremis' is a fairly entertaining if not overly impressive stand alone story. Flashbacks to the character's origin are also included throughout, that should help to fill in some blanks for those who may be new to the comic. The motion process itself has actually worked out quite well here and really does add another layer to the presentation. Granov's gorgeous painted artwork comes through strongly and while the procedure never comes close to actual animation quality, character's lips have been synced to dialogue and though stiff, movement has been added to their actions. Most impressive is the use of CG animation to realize the actual Iron Man suit. This could have potentially clashed with the otherwise 2D presentation, but thankfully the animators have found a great balance that still preserves Granov's style. Voice acting is pretty solid and effects and music work well to add excitement to the proceedings. While 'Iron Man: Extremis' is a comparatively good example of the motion comic process, the story itself does unfortunately have some issues. Though there is a fair amount of action, certain episodes are brought down by clunky extended scenes of dialogue and technobabble. While it's nice that Ellis has added a layer of actual science to the story, it isn't presented in a terribly interesting manner. Still, this is a solid take on the character and while not the most engaging story, it is the superior of the two series presented here. Written and illustrated by the Eisner Award Winning team of Brian Michael Bendis and Alex Maleev, 'Spider-Woman: Agent of S.W.O.R.D.' features Jessica Drew AKA Spider-Woman as she joins an alien hunting taskforce and travels to the fictional island of Madripoor to track down some evil extra terrestrials called the Skrull. Unlike Iron Man's adventure, this comic is drenched in Marvel's deep and complicated continuity and specifically deals with the fallout of one of their major companywide storylines. As such, those unfamiliar with the character and her recent hardships will be completely lost. While there is some value to be found here, unfortunately, the writing and animation leave quite a bit to be desired. Unlike the previous series, Maleev's gritty style does not lend itself well to this process. Animation is much more limited here with very little movement beyond simple pans and there is no lip syncing. The use of CG additions is also much more jarring and unimpressive. Though the art itself is great, it seems little effort has been made to take it to the next level. Voice acting is also not as strong and many attempts at humor fall completely flat because of poor performance choices. Action is also fairly limited and the story is even more dialogue intensive which doesn't exactly make for an engaging watch. On top of all that, the plot itself is quite meandering and convoluted. Overall, 'Marvel Knights Spider-Woman: Agent of S.W.O.R.D. / Iron Man: Extremis' is a pretty mediocre collection. 'Iron Man: Extremis' is visually impressive with decent production value, but its plot is lacking, and unfortunately 'Spider-Woman: Agent of S.W.O.R.D.' is unimpressive on all fronts. While all of the creators involved here are very talented, neither of these stories are among their best work. Though there certainly is a strong bond between cinema and comics and each of these series has strong cinematic qualities, all these motion comics really do is serve to emphasize the stark differences between the mediums. These stories may have read well on the page, but for the most part, they don't play well on the screen. Both series are presented in 1080p/AVC transfers in the 1.78:1 aspect ratio, and actually look quite strong. Both titles feature great detail that show off the distinct and impressive visual styles of their respective artists. Granov's realistic painted work carries a rich, almost three dimensional quality and Maleev's dark, rough pencils soak the screen with thickly textured noir influenced images. Black levels and contrast are mostly great though the blacks in Spider-Woman can sometimes appear a bit blue. Colors are beautifully realized, popping off the screen with both neon intensity and realistic boldness. On the downside, there are some instances of aliasing around the edges of characters and objects, though this is more noticeable during Spider-Woman than Iron Man. Also, the Spider-Woman series features some visible noise, though this may have been intentionally added to bolster the gritty style of Maleev's artwork. Overall, the transfer here lets the fantastic work of the artists shine through, providing a pleasing and sometimes impressive presentation. 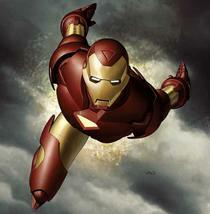 'Iron Man: Extremis' is presented in a DTS-HD Master Audio 5.1 track and 'Spider-Woman: Agent of S.W.O.R.D.' is presented in a DTS-HD Master Audio 2.0 track. Neither have any subtitle options. The Spider-Woman audio is surprisingly robust for a stereo track and features crisp dialogue and strong directionality. Dynamic range and bass are decent, though certainly not demo worthy and balance between all the effects is good. Iron Man features a respectable 5.1 mix that also includes clean dialogue. Directionality is good and rears are fairly lively with appropriate effects. Though imaging can be a bit unnatural at times, overall the work here is strong and provides a decent level of immersion. Dynamic range and bass are good, but not fantastic, and balance is well implemented. Overall, both of these audio tracks serve their stories well and are technically proficient. Shout Factory has included a slim but mildly interesting assortment of supplements which offer some insights into the motion comic process. All of the features are presented in standard definition with Dolby Digital 2.0 tracks and no subtitle options unless otherwise noted. A Conversation with Extremis Artist Adi Granov (SD, 17 min) - This is an interview with Adi Granov discussing his work on Extremis. He talks about his career path, unique style, and reaction to the motion comic. Behind the Scenes of Marvel Knights Animation (HD, 5 min) - Provided in 1080i, this is a brief look at the animation process of other Marvel Knights Animation projects and features interviews with Marvel Editor in Chief Joe Quesada and others. Methods used to extend the artist's original art and add lip syncing and movement are detailed. While short, this is actually an interesting look into the complicated process which brings the panels to life on screen. Behind the Scenes of Iron Man: Extremis (SD, 13 min) - Broken up into three parts viewable separately or together, this is a look at the making of Extremis. Interviews with the voice actors and animators are included discussing their process. Again, the footage of the actual motion comic procedure is fairly interesting to see and really demonstrates the kind of painstaking work that goes into the conversion. "Ready to Go" Music Video (Iron Man) (SD, 3 min) - A music video for an original rock song written for the comic. Not too interesting. "Watch Your Step" Music Video (Spider-Woman) (SD, 3 min) - A music video for an original pop song written for the comic. Again, pretty disposable. Marvel Super Heroes: What The--?! Starring Iron Man (SD, 3 min) - This feature is a short, stop motion animated sketch featuring an action figure of Iron Man hosting a game show parody. It's sort of funny… I guess. Visual History of Iron Man (HD, 2 min) - This consists of a slideshow of images detailing the character's visual evolution over the years. Visual History of Spider-Woman (HD, 1 min) - This consists of a slideshow of images and captions which describe Spider-Woman's complicated origin. Adi Granov Artist Gallery (HD, 1 min) - A slideshow of Iron Man art by Adi Granov. Alex Maleev Artist Gallery (HD, 1 min) - A slideshow of Spider-Woman art by Alex Maleev. Trailers - Trailer for both series as well as 'Astonishing X-men: Gifted' and 'Black Panther' motion comics are included. In the end, 'Marvel Knights Spider-Woman: Agent of S.W.O.R.D. / Iron Man: Extremis' is an unfortunately lackluster collection of comics. Though the motion process is at times impressive, the series themselves aren't that strong. Video and audio are solid though, and supplements are decent. Overall, this release will only appeal to big fans of these characters and their comics.